The CoolZÜCA Cooler is designed to fit perfectly inside a ZÜCA Sport. It is also made to sit on top and features Velcro straps, allowing you to fasten it to the ZÜCA Sport or Pro handle. CoolZÜCA can hold an entire case of standard 12oz beverage cans. It has a high-tech aluminized mylar heat shield which will keep stuff hot or cold and a closed-cell polyethylene thermal barrier. The zip-in liner can be removed for washing and also keeps the CoolZÜCA from leaking (as long as it is upright). 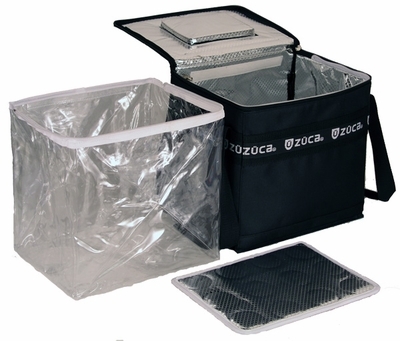 The insulated removable floor panel allows the CoolZÜCA to fold up, and also provides a shelf when needed to keep food away from wet cans and ice. Includes slings and shoulder strap.